Channel your inner Vera Stanhope when you knit this one-of-a-kind scarf! And use your knitting, embroidery, and sewing skills to make eight other projects inspired by our literary heroines. 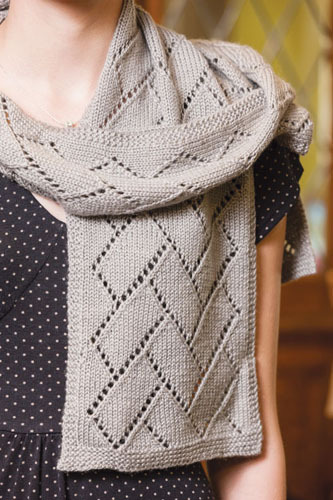 This cozy scarf will guard against any chill and the traditional Traveling Vines lace pattern features interconnected geometric shapes. 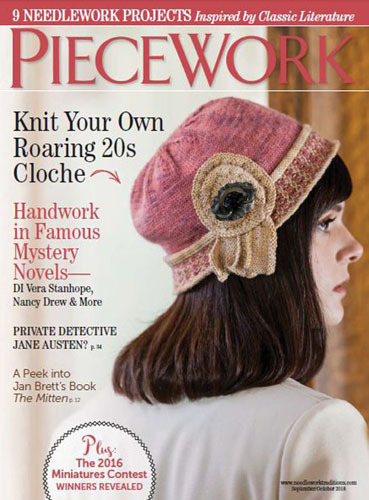 The included copy of PieceWork features eight additional projects to knit, embroider, and sew, inspired by the literary mystery genre. Susan Strawn used Erika Knight's British Bluefaced Leicester wool grown and spun in Yorkshire, a nod to Vera's home patch. In this beautiful scarf, Susan Strawn designed a tribute to the brilliant British television detective Vera Stanhope with a nod to the Northumberland landscapes and seascapes where the series takes place. This kit contains the yarn you need to make this gorgeous scarf, as well as a copy of PieceWork, September/October 2016. Enjoy behind-the-scene stories on your favorite authors such as Ngaio Marsh and Patricia Moyes. Discover nine total projects saluting our literary heroines, including a knitting bag inspired by Nancy Drew, Pippi's Long Stockings, and a delightful Regency-era doll dress fashioned after those of the Jane Austen period. Readers also get a glimpse into the world of beloved children's author Jan Brett and a pattern to re-create the lost mittens from her classic folktale The Mitten.